Dolores Ibárruri — known as “La Pasionaria”, one of just three women celebrated on statues in the City of Glasgow. The statue, the City of Glasgow and the Labour Movement’s tribute to the British Volunteers of the International Brigade who fought in the Spanish Civil War, was commissioned by the International Brigade Association of Scotland in 1974, and produced by the Liverpool based sculptor, Arthur Dooley. Dolores Ibárruri was born in Gallarta, Spain in 1895, the eighth of eleven children. She was born into a family of miners and experienced great poverty as a child. She wanted to be a teacher but instead left school at fifteen as her parents could not afford further education. Instead she went to work as a seamstress, a housemaid and a waitress. Later, she also married a miner and had six children. Due to the continued poverty of her family, only two of her children survived childhood. The family descended even further into poverty when her husband, an active trade unionist, was imprisoned for leading a strike. In response, Dolores joined the Communist Party, and was elected to the Provincial Committee of the Basque Communist Party. She also wrote articles for the miners’ newspaper, using the name under which she was to find fame, Pasionaria and went on to become editor of Spain’s leading left-wing newspaper. She founded Mujeres Antifascistas, a women’s organization opposed to Fascism and to war and in 1934 she attended the First Worldwide Meeting of Women against War and Fascism in Paris. 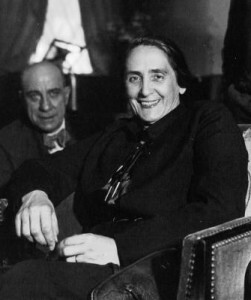 In 1936, and after several periods of imprisonment for her political views and activism, Dolores was elected to the Spanish Parliament, The Cortes Generales. While there, she campaigned for legislation to improve working, housing and health conditions, fought for land reform and rights for trade unionists and for women. When the Spanish Civil War broke out Dolores rallied people for the Republican cause, famously ending one radio speech with the words: “The fascists shall not pass! No Pasaran”; a phrase which became the battle cry for the Republican Army. During a visit to rally support in France and Belgium, she also coined the phrase “the Spanish people would rather die on its feet than live on its knees.” This phrase is carved on the plinth of La Pasionara statue in Glasgow. While it is true that Dolores didn’t create this phrase, rather that was Emiliano Zapata, but Dolores Ibárruri gave it new strength and new meaning. At the end of the Spanish Civil War, with Franco victorious, she escaped by plane to the Soviet Union, where over the years she represented her party at Kremlin congresses. She remained there until the death of Franco, when she returned to Spain. She was reelected to her deputy seat in the Spanish parliament but later resigned because of ill heath. She remained honorary president of the Spanish Communist Party until her death.